Last week the Supreme Court issued a landmark unanimous decision that the Eighth Amendment’s protections against excessive fines apply to the states, not just to the federal government. The decision was hailed by many as a major blow to the practice of civil asset forfeiture—when law enforcement agencies permanently seize property or money tied to criminal activity. However, despite the importance of the decision, experts familiar with civil asset forfeiture in Illinois caution that it won’t necessarily change much about the unfairness of the practice. Civil asset forfeiture ramped up in the mid-1980s as part of the war on drugs. By giving law enforcement agencies the ability to seize and keep cars, jewelry, cash, and other property discovered in the wake of arrests, it was considered an effective way to paralyze criminal organizations. But the practice has been increasingly criticized by liberals and conservatives alike for its infringement on private property rights and its disproportionately punitive impact on poor people of color. 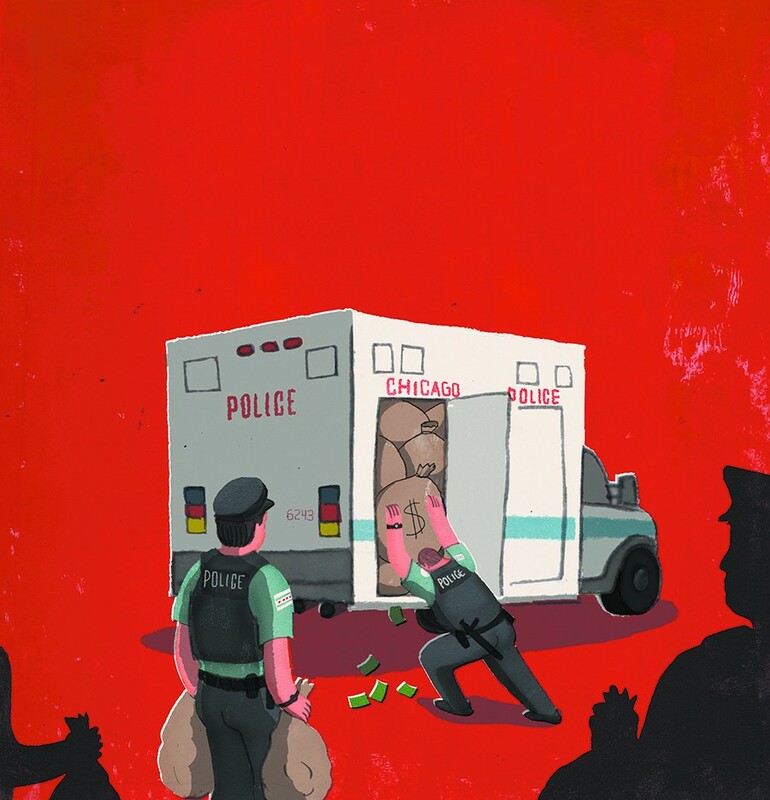 In 2016 a Reader investigation created a first-ever record of how the Chicago Police Department uses funds derived from civil asset forfeiture. With the help of FOIA’d records we found that between 2009 and 2016 CPD forfeited more than $70 million. About 65 percent of this was retained by the department and the rest divvied up between the Cook County State’s Attorney’s Office and the Illinois State Police. While this may not seem like a lot of money given the CPD’s more than $1.5 billion annual budget, the funds essentially created a substantial “shadow budget” for one unit within the police force—the Bureau of Organized Crime. This money was often spent on controversial surveillance equipment (like Stingray cell phone data capture technology), undercover officers’ car rental and cell phone bills, and office supplies. The fact that a division of CPD has a source of money not subject to the city’s budgeting process or regular public disclosure is also troubling because civil asset forfeiture often impacts people who aren’t themselves accused of a crime. For example, if a relative borrows someone’s car and is arrested after driving the vehicle to conduct an alleged drug deal, the owner of the car can have it taken away even if they have no knowledge of what the vehicle was used for and there’s been no conviction in the criminal case. In 2017, the ACLU of Illinois and allied groups successfully lobbied for reforms to the state civil asset forfeiture statute. Under the new law, property owners no longer have to pay to argue against the forfeiture in court. Law enforcement must auction off, rather than keep, forfeited property. The burden of proof for forfeiture has been shifted onto the state—it now has to make a more solid case for the property owner’s involvement in the crime to hang on to the seized assets (the presumption is no longer that the property owner is guilty). Finally, the new law requires the Illinois State Police to maintain a public database on civil asset forfeiture statewide, which is supposed to go live in 2020. Ben Ruddell, an attorney with the ACLU of Illinois who worked on the bill, calls these changes “incremental progress,” given law enforcement groups’ staunch opposition to the bill. “We did ultimately get them to the table to negotiate, but we had to sacrifice significant things,” he says. Assets can still be forfeited from third parties without any convictions in the associated criminal cases. The cops still get to keep funds derived from seizing assets and can use them however they want. In other words, there’s still “a built-in incentive for law enforcement agencies to seize property because it just comes back to them,” Ruddell explains. Ruddell has found some of the coverage of the Supreme Court decision to be “overstating” its consequences. But it may still have some positive impact, especially in the long term, he adds. While the decision doesn’t end profit-driven policing, people may now be emboldened to file more lawsuits claiming forfeitures of their property as unfair and disproportional. “As more of those cases are filed and adjudicated there’ll be a body of case law that gives shape and meaning to the question of when does forfeiture go too far,” Ruddell explains. The case that yielded the Supreme Court’s decision, Timbs v. Indiana, revolved around a $42,000 Land Rover SUV forfeited by the state in the wake of a conviction for selling a small amount of heroin. Tyson Timbs, who bought the car not with proceeds from drug sales but with money from his deceased father’s life insurance policy, sued Indiana for imposing an excessive fine. The value of the car was far greater than the maximum fine he could have been assessed for his particular conviction. While a trial and appellate court had ruled in his favor, ordering the state to return the car, the Indiana Supreme Court decided the state didn’t have to, reasoning that the Eighth Amendment excessive fine prohibition didn’t apply to state governments. “Now that the question has been definitively settled,” Ruddell says, “I think you’ll see a lot of litigation being filed for people seeking to challenge forfeitures on [Eighth Amendment] grounds.” He’s hopeful that more legal aid groups will find resources to take these cases on behalf of low-income people whose lives can be wrecked by the loss of a car, house, or other asset “contaminated” by a crime they may not have committed.